As I continue gathering materials related to uncanny black women in speculative literature and fiction, I stumbled across Nalo Hopkinson’s Brown Girl in the Ring (1998) at the Black Studies Annual Used Book Sale. 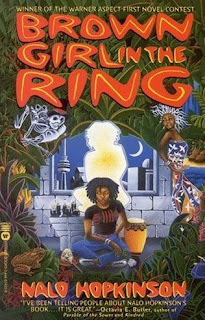 The narrative concentrates on a young African American girl named Ti-Jeanne her drug addict baby’s father, and her root-working grandmother who is feared by the whole community. Ti-Jeanne, who has an unnamed child whom she subconsciously rejects, must discover the truth about her ancestry, while attempting to accept the decisions she made for love, and the uncompromising danger that now surrounds her family. Ti-Jeanne is the only character in the novel who has successfully mastered the gift of foresight. Claimed as the child of the Prince of the Cemetery, Ti-Jeanne has the ability “to see how people were going to die, but never the peaceful deaths.” Her gift is also her curse as she begins to struggle to differentiate between the spirit world and reality. She is unusual not only because she possesses oracle abilities, but because she is able to master the ancestral spirits that visit her in her visions. One key scene that exposes Ti-Jeanne as an unusual black woman character is when she goes to kill Rudolph Baines who is her grandfather and the man who controls the posse—a local gang of thugs who kill and “catch human spirits in a bowl called a duppy.” Ti-Jeanne approaches Baines “with a gun in her hand laughing” to kill the spirit of her grandfather, and free the spirit of her mother. Outnumbered and unsure, “she must rely on instinct rather than thought” as she smart mouths the man who can order the trapped duppy spirit to flay her in the blink of an eye and take her spirit as his own. Ti-Jeanne’s unusual courage, oracle abilities, and strong family morals are what set her apart from the other characters in the story. Never thinking of merely her personal wants, Ti-Jeanne becomes a “duppy conqueror”—one who frees conquered spirits from the spirit catcher—and rejuvenates civilization in Muddy York, the crumbling barricaded inner city.